So here I am attending the heroes happen conference in Orlando, Florida. I left about an hour and a half early knowing I would get there on time. I was driving down the road and the first toll I come to, they said they won't take a company Amex card. I told them I didn’t have any cash so what happens now “do you take me to jail”? Here I was thinking I would have to pull off the side of the road and be talked to by a cop. Oh-boy, but he then spoke up and gave me a small toll violation sheet that says don't do it again. I pulled off at the next exit and got $20. So right before I was about to get off at the final exit, I go over this small bridge and a cop was waiting on the other side. Seeing that I was late, I was trying to make up time by going 77 mph. The thing I didn't know was this 4 lane highway had a speed limit of 55 mph. Oh boy, I got pulled over and I now have to pay $200 to an Orlando sheriff’s office. So I pull in to the convention center and now running about 30 minutes late and for those who haven't been to the Orange County convention center. It is huge, no doubt about it. So after driving around, I thought I arrived at the concourse, so I got my stuff together and started walking. I asked a staff person where Microsoft was and of course he had to say “not in this building”. Oh boy not again. I get back in my jeep and I find the Microsoft conference. I’m in the home stretch. Not ten minutes goes by and I have LOST MY WALLET! I drive back to the other parking lot to look and don't find it. I decide I’m wasting time and I guess I’ll call all my banks soon to cancel my cards. I go back to the convention center and found out they require $10 for parking. I don't have my wallet and therefore don't have cash. I decided to drive over the curb to get in. I’m not proud of it and will likely regret this for a while, but maybe ill mail the convention center $10. So I’m finally in. I arrive and the developer session is getting ready to start. 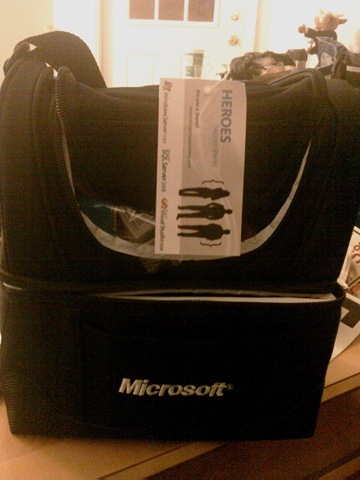 I grab one of those Microsoft handy dandy lunch boxes and go into the session. So anyone want to donate $200 to my cause? Email me at spoiledtechie (at) gmail dot com. The sessions are brought to us by www.Devfish.net. Disclaimer: I was expecting to write an in depth article on what I learned, but these sessions were not able to go into learning new things, it was all about what Microsoft rolled out and so my points are brief. They started off with a brief presentation and moved right into the changes with Visual Studio 2008. The split view allows for both your UI code and the UI display of the page to be displayed. It was one of those wonderful improvements that came with this upgrade. This feature allows you to change and upgrade your framework from 2.0 to 3.5 in just a few clicks. It is done by selecting the properties of the solution and clicking on the drop down in the display to select the framework. Quite impressive. The toolkit now comes with both .NET 3.5 and Visual Studio 2008. Both of which is old news, but still very cool. Next session: creating an outlook form control. They talked on how to implement our code into office products. They used a web service for communication along with LINQ. The front end was built with regions and WPF. They went on to discuss Sharepoint workflow's which looked interesting. They hit on about 20 steps in visual studio 2005 that needed to be completed in order to create workflow's. It looked extremely tedious, but now with VS 2008 It was only 3 steps. Side note: if you know Microsoft, you know they love blogger's and if you know me, you know I am not the one to hold back. So in this session, they were probably told by Microsoft just what to talk about and probably got a lot accomplished on those topics, but they definitely need to look for better speakers next time that can code and speak at the same time. Next session: smart client applications. Presented by Russ Fastino with Microsoft and John Goodyear with aspsoft. They talked about how to make client applications with a better user experience. They asked about the weaknesses of what Microsoft is doing with WPF. I had to speak up and tell tem that my MSDN license doesn't allow me to use the Expression Studio. It costs too much for the average developer to ask his boss to upgrade to a better user experience. Interesting point: WPF is offered in Visual Studio express and that means average developers can code with it and have it rendered. They then showed off the tech preview for Expression Blend 2008. Awesome stuff. I already played with it and used it, but its always fun to see it again. Expression Blend 2.5 has full Silverlight 2.0 support. P.S. I found my wallet and $20.00 when I went back to look for it where I got pulled over. Interestingly enough, I found $20.00 in the grass and the wallet on the passenger side of the jeep.